Today I’m in the mood for lighter fare. Maybe it’s the sunshine turning my thoughts to spring, maybe it’s yesterday’s decadent chicken wings, who knows? But this recipe is suiting me perfectly. I found it while thumbing though Vegetarian Times (October 2010) and it immediately caught my eye. Specifically as a way to showcase another one of my favorite salt free products: Bragg Apple Cider Vinegar, the one with The ‘Mother.’ How can you NOT be intrigued by that!? Bragg Apple Cider Vinegar is organic, raw and unfiltered. The ‘Mother’ refers to the brownish cobweb-like residue that collects on the bottom of each bottle, which looks unappealing but contains amazing health properties. I use Bragg as a base for dressings, to flavor salads, and I even have a friend (hey Erika!) who drinks a small glass daily to boost her immune system and keep things functioning tiptop. Anyway, today’s dish is indeed delightful. The sweetness of the carrot, apple and cranberries plays off the tartness of the vinegar and the lively zing of the garlic, scallion and (my favorite) parsley. If you don’t use fresh parsley often, this salad may change your mind. Too often it’s dismissed as a bland plate garnish, but parsley has such amazing flavor. I particularly love adding it to hummus veggie wraps. Speaking of which, that’s another way to enjoy this salad. Plain it’s great, but as a filling for Garden City Lavash, topped with some shredded Swiss cheese, it’s FABULOUS! 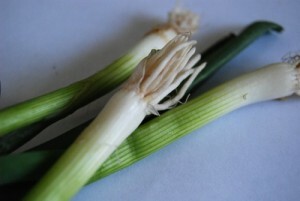 Combine cider vinegar and garlic in a small bowl and let stand 15 minutes. 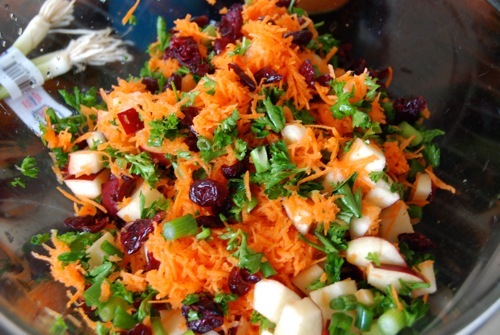 In a large bowl, stir together the carrots, apple, green onion, parsley and cranberries. 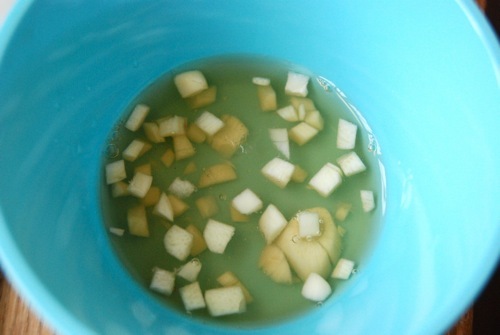 Whisk the agave nectar (or honey) and oil into the vinegar mixture. 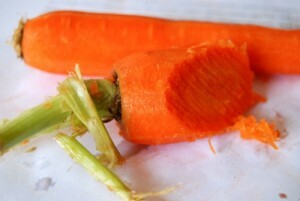 Add to the carrot mixture and toss to coat. Season with freshly ground pepper to taste. Cover and chill 2 hours, or overnight. 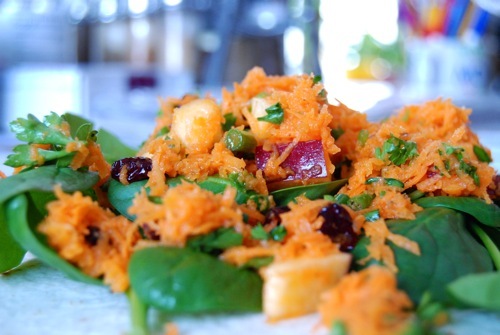 Serve chilled salad over the bed of baby spinach leaves. This entry was posted in Salads and Dressings, Vegetarian and tagged Bragg Apple Cider Vinegar, Garden City Lavash, Vegetarian Times. Bookmark the permalink. Thanks Melissa – it IS! Hope you try it and ENJOY. 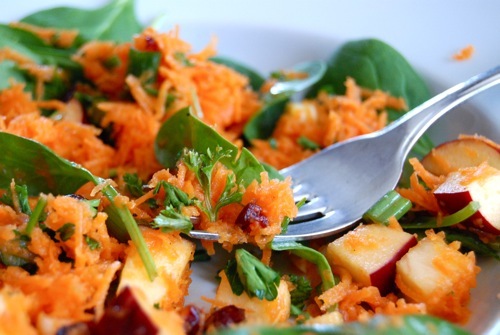 This salad looks very bright and cheerful, though! Thanks Inky! It’s turned gray here too.. but at least it’s not raining! i just bought apple cider vinegar for the first time in my life for the pavlova i made over the weekend. i didn’t even know the stuff existed and wondered what else it was used for. thanks for letting me know–it makes sense now! tell me more about agave…i’ve seen it around but haven’t tried it. is it a natural sweetener? how is it different from honey? I read that Nat and lauuuuuughed. Can’t believe you’ve never before owned apple cider vinegar – such wonderful stuff! Now you can make your own dressings and marinades.